Last night at the expo for packet pick up we didn’t get to see Constantina Dita. Apparently they had her speaking that evening at another location, but we didn’t learn about it until we riffled through our goodie bags when we were all the way back home, by then it was too late. Rob ended up doing the 15K with me!! So it was an early morning, wake up at 4am and get to gearing up for the race. We were on the road by 5:15am and got a good parking spot at 6am. That left us with 50 mins so I could drink some water, go tinkle like a 100 times (well three), and warm up. The 4 mile and 15K race participants start together. It was approximately 5,000 of us packed onto the streets. Even with the min per mile line up signs it was very apparent in the first couple miles that people clearly did not pay attention to that. This was a no headphones race, which is fine except having to hear certain runners gab it up about random stuff. I guess it serves as motivation to get away from them, but I would much rather fill my ears with a more productive noise if given the choice. It was 74 degrees, 85% humidity, and sunny with a light breeze. 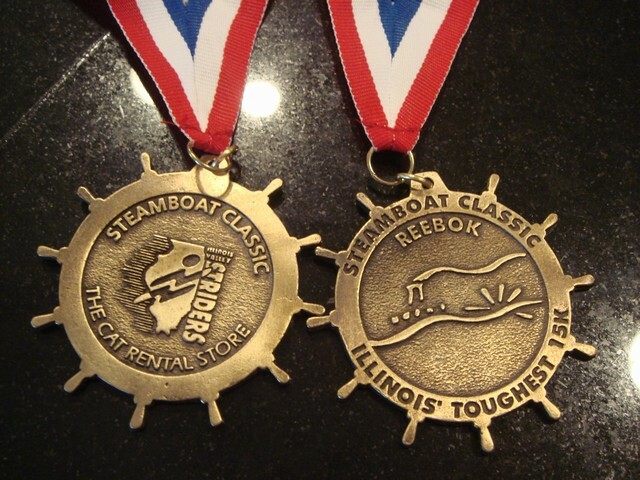 The 15K route is advertised as “Illinois Toughest 15K”, and I believe them. I have only ran this course one time before (last year) and when I finished I stated “That was worse than a half marathon”. Courtesy of the very steep hills that climb up 225-250 feet with a percentage grade change of 10-12% (according to my Garmin). What makes it even more twisted is they have us run the hilly portion TWICE. Yep I’m not sure how I agree to do these things, but here I am about to run what is in my logbook so far as the most difficult race I have run (I assume the marathon will change that in the future). So with a year since running this course I thought, maybe I had built up the hills in my mind. Maybe it isn’t as difficult as I remember. Although my strength was much better and felt strong the whole time (a new PR too! 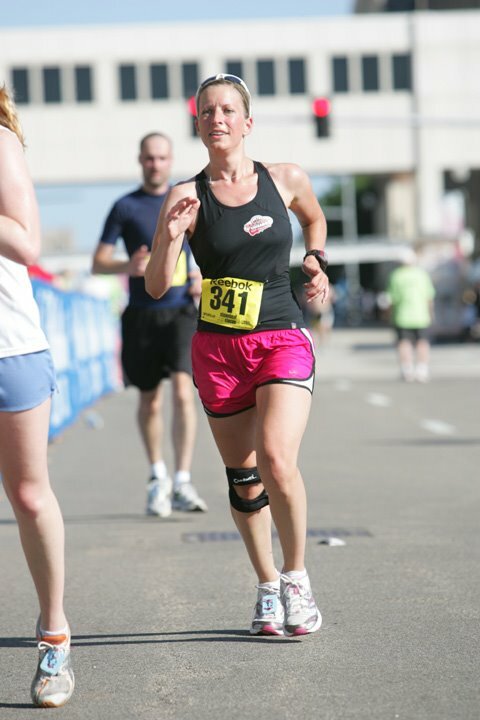 ), it is still the most difficult race I have ever ran. The first two miles were with the 4 mile racers which meant more dodging and weaving around people for quite awhile. Then our course breaks off and starts the steep climbing. The hills and park area were miles 3-7 and then our final 2.32 miles finished up in the 4 Mile course through downtown. The highlights of the race were Rob and I stayed near each other the most of the time without trying. We would switch up lead between each other during different parts of the course. See him pass me or me passing him definitely kept the race interesting to have that nice surprise of seeing each other so much. The other highlight was that in the park area the course went through the maintenance-ish area of the zoo. On the second lap around the hilly park, (before the 10K mark) we went through this zoo area again and a zoo staff person had a huge porcupine on a leash and was walking him and trying to get him to another location by having him pass in between the space of the runner’s path. Rob and I were right next to each other at the time and when we saw the porcupine we both said at the same time and in the same tone “woah!”, it was pretty funny. I then said “hi porcupine” which is my usual greeting for friendly looking animals. So after we pass I hear the zoo staff assistant trying to coax the porcupine to pass in front of the runner’s path when there was a space and the porcupine was not having it. What a strange and great surprise to see one that up close! The rest of the running went well and I was so glad to feel strong and have zero IT band or any other pain come up. Me coming around the last turn to the finish. My shorts are soaked from sweat and cups of water that I drank and then poured the rest on myself. I PRed with 1:24:38, taking 11 minutes off my previous year’s time. Rob got an automatic PR with this being his first 15K and came in at 1:26:29!! It was also cool because of where Rob is in his marathon training this was his longest run so far and he ran very strong! After we finished I grabbed a couple waters and diet mountain dew and I was ready to go. This race has a very nice post race party, but it is very crowded and I was ready to get home and get cleaned up. I sweat at this race like no other, it’s gross. Like I jumped in a pool, that’s pretty bad. The 15K finishers get a sweet medal. It was a wonderful race and I’m so glad all went well! Great job!!! So happy for your PR. Also, a porcupine???!!!! How crazy. Nice work guys!! I saw you both just after the first loop. You looked pretty serious, so I didn't want to distract your focus! My stopwatch time was 1:20:53…I'm pretty pleased with it. The hills weren't as bad as I thought they would be. Post race was decent, but you are right…way too many people trying to get beer. Nice race! Congrats! Awesome time, and how nice that you & Rob were able to race together. I love those shorts! i have them in black and pink opposite of yours haha! I was at the Steamboat yesterday and was searching for the climb on that (those) hills when I came across your blog. They tell you it is supposedly the hardest 15 K in Illinois, but they don’t tell you why…… I did the race for the second time, and finished a lot better than last year, but those hills are not any easier. Thanks for posting the grade and climb of that hill. I need to evoke some sympathy from friends, and congrats on a great race.